Marcelo started playing futsal at the age of nine and by the age of 13, he was on the books of Fluminense in Rio de Janeiro. He comes from a very poor background and even considered quitting football, but his grandfather convinced him to continue with the sport. 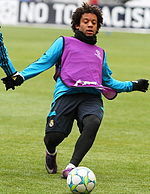 Marcelo joined Real Madrid during the January transfer window in 2007. On his arrival, club President Ramón Calderón said, "He is an important signing for us. He is a young player who will inject some freshness into the side and is part of our plan to bring younger players into the squad. We're very happy because he's a pearl that half of Europe wanted." Many spectators hailed him as Roberto Carlos' potential successor in the left-back role. Marcelo made his debut as a substitute in the 2–0 defeat against Deportivo La Coruña on 7 January 2007. On 14 April 2007, then coach Fabio Capello gave Marcelo his first start for Real Madrid against Racing de Santander. Real Madrid controversially lost the game 2–1. In the 2007–08 season, Marcelo started nearly all of Madrid's league games under the new manager Bernd Schuster. His ability, speed running across the field, attack, and defence had enabled him to become a very important player for Real Madrid. After a string of poor performances in 2009, Marcelo found himself on the bench for much of the remaining season while under new manager Juande Ramos, mainly as deputy to the more defensive-minded Gabriel Heinze. Ramos deployed Marcelo as a winger on more than one occasion, and the Brazilian adapted well to his new role. He scored his first goal after receiving a heel flick from striker Gonzalo Higuaín and slotting the ball past the goalkeeper in Madrid's 4–0 thumping of Sporting de Gijón. After the game, coach Ramos declared that Marcelo's future would be positioned as a winger, but will push back to defense when required. Marcelo scored his second goal for Real Madrid in a victory over Almería, a powerful strike from outside the box with his weaker right foot. On 18 April 2009, he scored his third goal of his Real Madrid career, when he scored the only goal of the game against Recreativo de Huelva away from home. He scored his fourth goal against Sevilla at the Estadio Ramón Sánchez Pizjuán in April 2009. Under the next head coach Manuel Pellegrini, Marcelo consistently featured in the starting XI for his versatility and pace along the left flank in offensive and defensive roles. He continued to be employed as a left-winger under Pellegrini, and reached the top of the assist charts of La Liga in the 2009–10 season. He admitted in a press conference at the end of 2009, "I now feel better playing as a winger." His successful performance in Real Madrid's 2009–10 campaign earned him a contract extension on 5 February 2010 with the club until June 2015. This season proved to be his breakthrough season at the club. In the 2010–11 season under new coach José Mourinho, Marcelo was back in his natural position of left back. He started all league games, paying back the coach's confidence in him with defensive steel and attacking intent and gained the coach's admiration. On 25 November 2010, Marcelo was named as a part of the 55 player shortlist for the FIFA World XI. He scored his first goal of the new season in a 1–0 win against RCD Espanyol on 13 February. He had a terrific match against Olympique Lyonnais in the Champions League. Showing his attacking flair and defensive skills, he opened the scoring with his first-ever Champions League goal and assisted Karim Benzema's goal, at the end he was named man of the match, of which Real went on to win 3–0, and progressed to the quarter-finals for the first time since 2004. Marcelo then continued his fine season by scoring in the second leg against FC Barcelona in the Camp Nou. The game ended 1–1. Marcelo's successful campaign in the Champions League earned him a starting spot in UEFA's starting XI. Marcelo was heavily praised by the worldwide media during that season, and many called him the best left back in the world. Diego Maradona said he was the third best player in La Liga, after Cristiano Ronaldo and Lionel Messi. Marcelo was sent off on 17 August 2011 at Madrid's 3–2 loss to FC Barcelona. On 3 December 2011, Marcelo scored Madrid's third goal in a 3–0 victory over Sporting de Gijón in La Liga. Paolo Maldini gave credits to Marcelo and called him the current left back, "who is a great attacker and a defender, a specialist of both areas." Roberto Carlos named Marcelo as the world's best left back, saying. "He had more ability than me with the ball and he joins in better," and even called him his heir. Marcelo had shown great performances as a left back, such as in the Champions League quarter-finals against Cypriot club APOEL, while entering as a substitute in the 75th minute for Fábio Coentrão. Marcelo was part of the starting XI as Real Madrid claimed their 32nd league title. Marcelo was also involved with the Brazilian Olympic football team at the 2012 Summer Olympics in London. Marcelo scored his first goal of the season against Manchester City in the Champions League Group stage on 19 September, Real's first goal of a 3–2 win at the Santiago Bernabéu. As of February 2013, Marcelo had returned from injury and captained Real Madrid on 23 February at the Estadio Riazor which ended in a 2–1 victory for Los Merengues. On 20 April, he played as the captain again against Real Betis at the Santiago Bernabéu. In the 14th minute, he sustained a muscle injury after intercepting a long through-ball, but the game ended in 3–1 victory for the home side. Marcelo scored the opening goal for Real Madrid against Chelsea in the Guinness International Champions Cup 2013 final on 7 August, Real Madrid won 3–1. During the league season, he played 28 matches, and scored one goal, in a 3–0 win over Levante UD on 9 March. Marcelo scored Real Madrid's third goal of their 4–1 win in the 2014 UEFA Champions League Final against city rivals Atlético Madrid, with an extra-time strike from outside the box after coming on as a substitute for Fábio Coentrão. On 10 July 2015, Marcelo signed a new contract with Real Madrid, keeping him at the club until 2020. On 18 October 2015, he scored his first goal of the season by scoring Real Madrid's first goal in a 3–0 home win against Levante UD. He played 30 matches when Madrid won the 2016–17 La Liga and was a regular starter when Madrid won the 2016–17 UEFA Champions League. On 13 September 2017, Marcelo signed a new contract which keeps him at the club until summer 2022. During the 2017–18 UEFA Champions League, he made eleven appearances, while scoring three goals, when Madrid won their third consecutive and 13th overall Champions League title. Argentina's Lionel Messi evades Marcelo in the semi-final of the 2008 Summer Olympics. Marcelo scored on his Brazil debut against Wales at Tottenham Hotspur's White Hart Lane (the score finished 2–0). He picked up the ball just outside the Wales box and shot for a traditional Brazilian full-back goal. 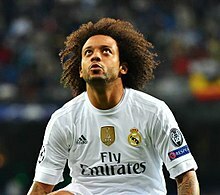 Marcelo has been compared to former Real Madrid and Brazilian national team left-back Roberto Carlos, who also played for Real Madrid. The two had played together during the second half of the 2006–07 season before Carlos' move to Turkish team Fenerbahçe. He was called up for the 2008 Olympic squad, where he won a bronze medal. In May 2010, he was named as one of the seven players serving as backup for Brazil's 2010 FIFA World Cup squad. Despite not being called up by then Brazil coach Dunga, he was selected again by new boss Mano Menezes for a friendly against the United States on 10 August 2010. He was the Man of the Match for a friendly 2–1 win against Mexico away on 11 October 2011, scoring the winner by dribbling past several players and then blasting the goal into the net. He was part of Brazil's 2012 Olympic team, as one of the three over-age players, where Brazil won a silver medal. Marcelo was selected as a member of Brazil to play in the 2013 Confederations Cup. He was part of the Brazil's starting lineup for all five matches, including the 3–0 victory over Spain in the final. In the 2014 FIFA World Cup, Marcelo scored an own goal in the 11th minute of the opening game against Croatia on 12 June, deflecting a shot by Nikica Jelavić for the first goal of the competition. It was the first own goal that Brazil had scored at the World Cup, although they eventually won the match 3–1. In May 2018 he was named in the final squad for the 2018 FIFA World Cup. Known mainly for his offensive capabilities, trickery, and technical qualities, Marcelo plays mainly as a left-sided attacking full-back or wing-back, but can also operate as a left winger, or even in midfield. His flair, grace, touch, and control on the ball, couple with his speed, agility, and dribbling skills, frequently see him beat opponents in one on one situations with elaborate feints, such as step overs. His explosive pace, energy, and clever movement, both on and off the ball, also make him a dangerous threat on counter-attacks; he is capable of penetrating between the opposing defensive lines with attacking runs, or getting up the left flank into good offensive positions positions from which he can receive the ball often, and provide width for his team, essentially acting as an additional forward. Moreover, his crossing ability, precise passing, and his eye for the final ball also allow him to function as a secondary playmaker for his team, and enable him to link-up with other players, create goalscoring chances, and provide assists for teammates. While naturally left footed, he is also adept with his right foot, which enables him to cut inside from the left wing, attempt a shot from outside the area, and even score goals. [nb 1] Despite his ability going forward, however, the defensive side of Marcelo's game has been brought into question by pundits on occasion, however, who have cited his defensive solidity, work-rate, concentration, positioning, and awareness as areas of weakness in need of improvement. After his breakthrough season, in 2011 Marcelo was praised by football legends such as Paolo Maldini and Diego Maradona, the latter of whom also called him the best player in the world in his position. Due to his attacking prowess, nationality, and playing role, Marcelo has frequently been compared to compatriot Roberto Carlos, who himself described Marcelo as his heir in 2012, and also labelled him as the world's best left back; regarding Marcelo's technical skills, he commented: "Marcelo possesses a better technical ability than me." Due to his skill, attacking abilities, achievements, and decisive performances in important games, Marcelo is considered by many in the sport as the best left back in the world, one of Brazil's best players ever, and one of the greatest left backs of all time. In 2008, Marcelo married his longtime girlfriend Clarice Alves and on 24 September 2009, they had their first child, a son named Enzo Gattuso Alves Vieira. Their second son, Liam was born on 1 September 2015. He has a number of tattoos, including his shirt number and day of birth (12) tattooed onto his left arm. His grandfather Pedro is also tattooed on his arm. San Pedro is his grandfather who paid the money so he could keep playing football back in Brazil. Marcelo dedicates every goal to him and his wife. He said for Real Madrid TV that if it wasn't for Pedro he would have never played football for Fluminense. His grandfather died in July 2014, during the World Cup. On 26 July 2011 Marcelo attained Spanish nationality, which allows him to be registered normally rather than as a non-EU player, of which there is a strict quota allowed. In April 2013, Marcelo was unveiled as one of Adidas' new icons for the German brand during a promotional event at the Bernabéu store, showcasing the F50 adiZero and he joins an array of Real Madrid teammates that also wear the Adidas brand including Gareth Bale and Karim Benzema. At the event Marcelo said, "Throughout my career, I have achieved some of my dreams, and this is one too. Being next to these stars is fantastic. They have congratulated me, it's a great brand and I am happy." Marcelo battles Croatia's Ivan Perišić for the ball during the opening match of the tournament at the 2014 FIFA World Cup. ^ "Player Profile". Real Madrid C.F Official Web Site. Retrieved 6 February 2014. ^ a b "Top 5 Full Backs who can play as Wingers/Midfielders". sportskeeda.com. 16 April 2014. ^ "Real Madrid signs defender Marcelo". 15 November 2006. Retrieved 17 July 2017. ^ "Marcelo: Already a Real Madrid legend - MARCA in English". MARCA in English. Retrieved 12 October 2018. ^ a b "Marcelo Bio, Stats, and Results". Olympics at Sports-Reference.com. Retrieved 31 July 2017. ^ a b "World Cup: Neymar named in Brazil's 23-man squad". BBC Sport. 14 May 2018. ^ "Sky Sports – Football – Match Facts – Deportivo v Real Madrid – 7th January 2007". Sky Sports. Archived from the original on 14 January 2007. ^ Realmadridnews.com (15 November 2016). "Marcelo, Ten Years of Success at Real Madrid -". ^ "Marcelo Sees Real Madrid Past Recreativo Huelva". goal.com. 18 April 2009. ^ Marcelo "Me encuentro mejor ahora que juego de extremo". AS.com (28 December 2009). Retrieved on 21 June 2012. ^ FINISHED Marcelo Signs Real Madrid Contact Extension. Goal.com (5 February 2010). Retrieved on 21 June 2012. ^ FIFA Announces 55-Man Shortlist For 2010 World XI. Goal.com (25 November 2010). Retrieved on 21 June 2012. ^ Jenson, Pete (17 March 2011). "Marcelo calms Real nerves as Mourinho ends seven-year wait". The Independent. London. ^ a b Diego Maradona tips Tottenham target Sergio Aguero to join Real Madrid one day. Goal.com (24 February 2011). Retrieved on 21 June 2012. ^ a b Paolo Maldini: Tottenham Hotspur's Gareth Bale only knows how to attack. Goal.com (16 December 2011). Retrieved on 21 June 2012. ^ a b La Liga Headlines: Roberto Carlos: Marcelo best in world Archived 31 March 2012 at the Wayback Machine. Adifferentleague.co.uk (29 March 2012). Retrieved on 21 June 2012. ^ Bevan, Paul (12 September 2012). "Real Madrid 3–2 Man City". BBC Sport. Retrieved 26 May 2014. ^ "Real Madrid beat Chelsea 3–1 to claim the International Champions Cup". Sky Sports News. 7 August 2013. Retrieved 26 May 2014. ^ Jurejko, Jonathan (9 March 2014). "Real Madrid 3–0 Levante". BBC Sport. Retrieved 26 May 2014. ^ "Real Madrid 4 Atlético Madrid 1". BBC Sport. Retrieved 25 May 2014. ^ "Marcelo, at Real Madrid until 2020". Real Madrid C.F. 10 July 2015. Retrieved 10 July 2015. ^ "Official Announcement: Marcelo". Real Madrid C.F. 10 July 2015. Retrieved 10 July 2015. ^ "Marcelo's contract extension". realmadrid.com. 13 September 2017. ^ McTear, Euan (6 February 2017). "How Marcelo replaced the irreplaceable Roberto Carlos". These Football Times. Retrieved 3 May 2018. ^ "Neymar fires Brazil to comeback victory". FIFA. Retrieved 12 June 2014. ^ a b c "FourFourTwo's 100 Best Football Players in the World 2018". FourFourTwo. 19 December 2018. Retrieved 12 March 2019. ^ a b c d Venkatesh Mishra (12 October 2017). "Marcelo - Real Madrid's lifeline down the left". www.sportskeeda.com. Retrieved 12 March 2019. ^ a b Eduardo Alvarez (3 February 2016). "Marcelo and Isco prosper at Real Madrid under Zinedine Zidane". ESPN FC. Retrieved 12 March 2019. ^ Matt McGinn (14 September 2017). "Marcelo, Casemiro connection is what really drives Real Madrid forward". ESPN FC. Retrieved 12 March 2019. ^ Sid Lowe (28 May 2017). "Marcelo and Dani Alves make Champions League final a battle of the full-backs". The Guardian. Retrieved 12 March 2019. ^ Sid Lowe (1 May 2017). "Marcelo's importance to the Real Madrid machine cannot be underestimated". The Guardian. Retrieved 12 March 2019. ^ Kelvin Leong (26 November 2018). "Hankook "Be one with it": Marcelo's winning control gives Real Madrid the edge". www.foxsportsasia.com. Retrieved 12 March 2019. ^ Matt Jones (6 September 2018). "Marcelo Dismisses Real Madrid Exit Talk, Wants to Stay at Club 'Until the End'". Bleacher Report. Retrieved 12 March 2019. ^ Gabriele Marcotti (4 May 2017). "Marcelo, Dani Alves continue to redefine full-back role for Real, Juve". ESPN FC. Retrieved 12 March 2019. ^ Matt McGinn (30 January 2018). "Marcelo's return to form comes in the nick of time for Real Madrid". ESPN FC. Retrieved 12 March 2019. ^ Javier de Paz Seguir (4 June 2014). "Juventus in pursuit of Marcelo for next season". as.com. Retrieved 12 March 2019. ^ a b Rubén Jiménez (8 May 2018). "Marcelo is the gamebreaker for Real Madrid". Marca. Retrieved 12 March 2019. ^ Kiyan Sobhani (2 October 2015). "Marcelo's defensive naivety could cost Real Madrid". FourFourTwo. Retrieved 12 March 2019. ^ Richard Fitzpatrick (30 January 2019). "Marcelo: Previously 'Untouchable' but Now out of Favour at Real Madrid". Bleacher Report. Retrieved 12 March 2019. ^ "Marcelo finds himself among Brazil's all-time football elite". ESPN.com. Retrieved 12 October 2018. ^ "Marcelo, the best left-back in the world | Real Madrid CF". Real Madrid C.F. - Web Oficial. Retrieved 12 October 2018. ^ "Marcelo Stays in Camp Despite Grandfather's Death". ABC News. 5 July 2014. Retrieved 6 July 2014. ^ "Real Madrid wing-back Marcelo gains Spanish passport". Tribal Football. Retrieved 1 April 2019. ^ "Marcelo granted Spanish nationality". The World Game. Special Broadcasting Service. Retrieved 1 April 2019. ^ Coerts, Stefan. "Real Madrid's Marcelo granted Spanish citizenship". goal.com. Retrieved 1 April 2019. ^ "Marcelo revela desejo de jogar no Botafogo". Jornal Extra. 22 March 2016. Retrieved 27 January 2017. ^ "Marcelo Presented as adidas Icon". Football Boots. ^ Marcelo at Soccerway. Retrieved 2 March 2019. ^ "Marcelo". National Football Teams. Benjamin Strack-Zimmerman. Retrieved 23 March 2018. ^ "Campeão, São Paulo domina a seleção do Brasileiro" (in Portuguese). Terra. 4 December 2006. Retrieved 21 June 2009. ^ "The Liga BBVA 2015/16 Team of the Season". Liga de Fútbol Profesional. 1 June 2016. Retrieved 4 June 2016. ^ "UEFA Champions League Squad of the Season". UEFA.com. 5 June 2017. Retrieved 6 June 2017. Wikimedia Commons has media related to Marcelo Vieira.